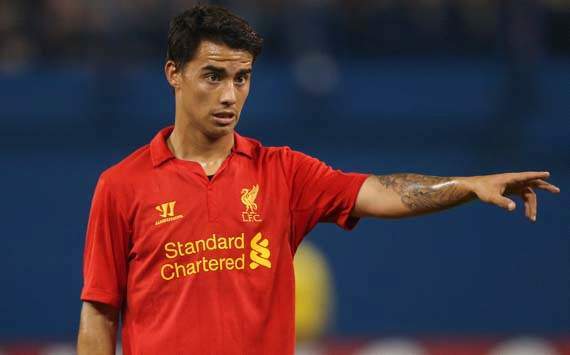 Liverpool midfielder Suso has put pen to paper on a new long-term contract with the club. The 18-year-old joined the Merseyside outfit from his local side Cadiz in 2010, featuring in the Reds' youth and reserves teams before making his senior debut against Young Boys in the UEFA Europa League in September. The teenager has now played for the first team on four occasions, and indicated that manager Brendan Rodgers' belief in him was a huge factor behind the extension. "I am really happy," Suso told the club's official website. "Liverpool are one of the biggest clubs in the world and this is the right place for me. I am happy Brendan has shown trust in me. I had no questions about signing a new deal and I am really glad to have done so. "I am comfortable here. I have played some games for the first team and I hope to continue doing that, but I need to work hard every day for that to happen. This is one of the best days of my life." Rodgers had indicated on Thursday that a deal was near completion, stating that he has been really impressed with the youngster's technique and creativity. The Northern Irishman reiterated his thoughts about the player's abilities, adding that his commitment to the club is great news. "We are all delighted Suso has committed his long-term future to Liverpool Football club," Rodgers said. "At 18, he has demonstrated outstanding technical qualities but also shown very good temperament to play for such a prestigious club. His commitment is very good news for all our young Academy players and the excellent work taken place by the Academy coaches and staff."